ZANDO Designs renovation projects run the gamut from simple re-modeling and updating to extensive rehabilitation and additions to both historic and contemporary homes and structures. Libby Zando’s educational background and extensive experience make her especially adept at creating useful and attractive spaces within the confines and restrictions of existing structures. A recently retired couple, both artists, wanted to extensively renovate their Lewes farmhouse-style cottage. They hired ZANDO Designs because they felt the company was sensitive to their ideas. They also wanted to have some flexibility and creativity as the project progressed. They knew of Libby’s art background and were confident that she would produce unique and creative solutions. 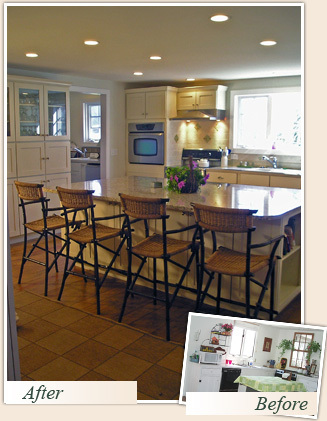 The ZANDO Designs crew removed dark paneling and cabinets and several layers of old flooring to revamp the grim kitchen layout. 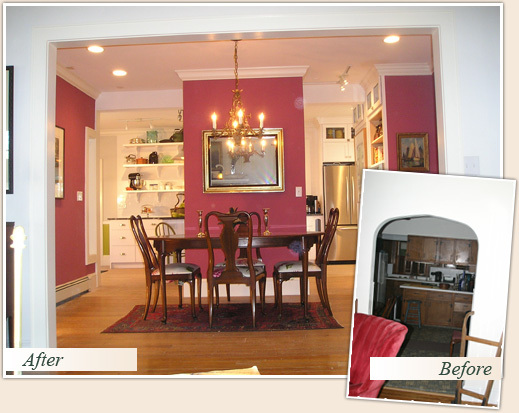 Low ceilings in an existing adjacent porch were removed and helped to further brighten the enlarged kitchen and laundry room. The owners had an antique fireplace mantle and wanted it reconstructed as a room divider equipped with gas logs to create a central hearth. The wall created by this fireplace now defines the dining room and provides a lovely display area for a family artwork. ZANDO Designs is well-known for renovations and additions that are sensitive to historic architectural and local community standards and requirements. An historic ship captain’s home, which was moved to its current site in Lewes in the 1980s, included a small shed which was used as a one car garage. The new owners needed a larger two-car garage with room for storage and a work area while complimenting the older architecture in the historic neighborhood. 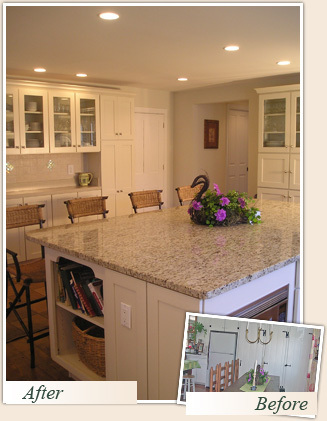 They also wanted an addition to the house to include a pantry and mudroom/laundry area and an upgraded kitchen. ZANDO Designs encouraged the owners to utilize the original garage doors as part of the newly designed garage and to incorporate carriage-style wooden doors as the operable doors. 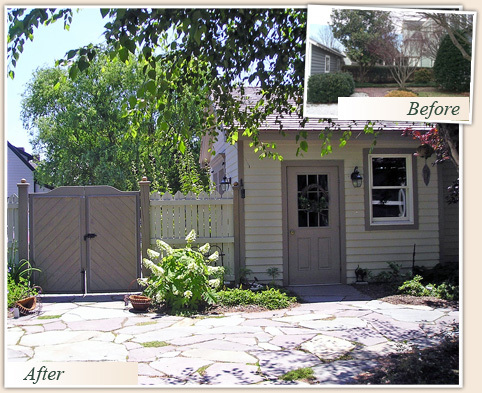 An outdoor shower and entry gates were attached to provide privacy and to complement the Victorian home and garden. ZANDO Designs created a new addition on the side for the mudroom/laundry area using similar lines and materials as the other bay structures on the house. A side entrance with fencing and steps now opens to a charming herb garden. Improvements were made to the outdoor areas by adding walkways, pavers and patio areas throughout the courtyard garden.